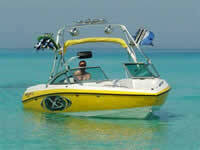 The Mastercraft X-30: The Ultimate for Water Sports and Family Days Out! For those seeking tranquillity and sun, what better way to soak up the inspiring views of the Balearics than from this adventurous fun-seeking boat? The opportunity to endlessly explore Ibiza’s exclusive coastline has arrived in style. Spend a day visiting the crystal clear waters of Formentera with its amazing sea food restaurants, or the chic and trendy las Salinas beach for drinks at the Jockey Club. Wherever your chosen destination, we can take you there in comfort and style. To add a spark of adventure to your holiday why not show off your water sports skills with our professional range of wake boarding equipment. Or for lots of fun with no skill involved, have a go at being thrown around in the inflatable doughnut. 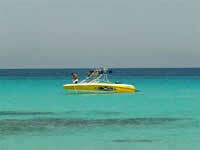 This professional water sports boat comes fully equipped with wake boards, water skis a doughnut and snorkelling masks. The service provides its own skipper who will take you to the Islands very best locations and may assist you in water sports. The boat holds a maximum of 6 Guests with plenty of comfy seating, an open bow with additional seating and a sun lounge area on the back. For those wanting a family or group day out, day charter is available, with full use of all water sports equipment. However, for those only looking to participate in water sports, minimum bookings of 4 hours are available. For your safety this boat is only available with our own fully qualified skipper. Book now to avoid disappointment by contacting us .